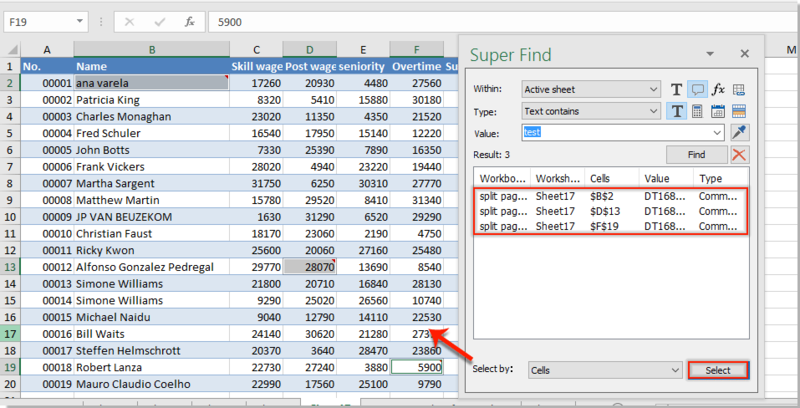 Cabhraíonn feidhm Find in Excel le húsáideoirí luach ar leith a fháil i dtrácht laistigh den bhileog gníomhach, roghnaithe nó an leabhar oibre iomlán. Mar sin féin, an bhfuil a fhios agat conas na cealla tráchta a aimsiú agus a roghnú bunaithe ar fhad an téacs i dtrácht nó má thosaíonn an t-ábhar tráchta le carachtar áirithe? 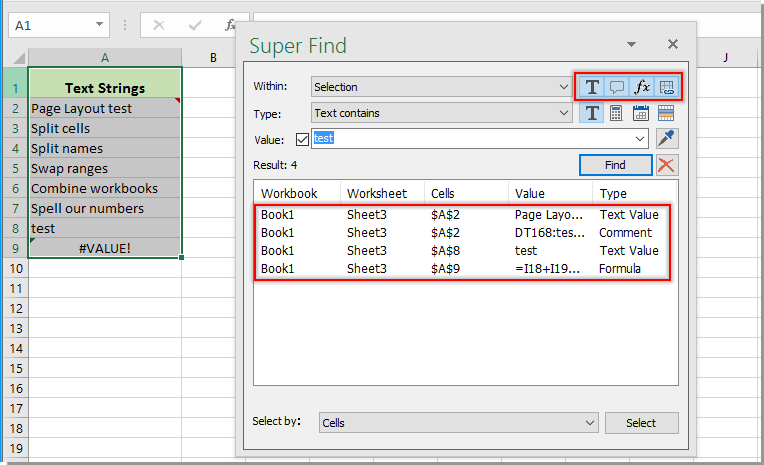 Anseo an cumhachtach Super Faigh fóntais Kutools le haghaidh Excel déanfaidh tú taitneamh a bhaint as na cealla tráchta ar leith a fháil go héasca laistigh de rogha, bileog ghníomhach, bileoga roghnaithe, leabhar oibre iomlán nó gach leabhar oibre oscailte. Déan mar seo a leanas chun cealla ar leith a aimsiú agus a roghnú ina bhfuil téacs áirithe nó luach amháin i dtuairimí in Excel. 2.2) Sonraigh an raon aimsithe ón liosta lag Laistigh. Soláthraímid cúig rogha anseo ina measc Roghnú, Bileog Ghníomhach, Bileoga oibre roghnaithe, Leabhar oibre gníomhach comh maith le Gach leabhar oibre sa Laistigh de titim síos. Is féidir leat aon cheann a roghnú de réir mar is gá duit. 2.3) Roghnaigh Tá an téacs rogha ón cineál liosta anuas. 2.4) Cuir isteach an téacs a gheobhaidh tú i dtrácht chuig an luach Bosca téacs. 3. Anois tá gach cealla comhoiriúnach le fáil amach agus liostaithe sa Toradh bosca an Super Faigh pane. Is féidir leat cliceáil ar an gcill atá liostaithe chun é a roghnú sa bhileog oibre nó cliceáil ar an Roghnaigh cnaipe chun gach ceall atá liostaithe a roghnú ag an am céanna. Thairis sin, is féidir leat cealla ar leith a aimsiú agus a roghnú bunaithe ar fhad téacs áirithe i dtuairimí. Déan mar a leanas. 2.2) Sonraigh an raon aimsithe ó Laistigh de liosta anuas. 2.3) Roghnaigh rogha fad mar is gá duit ón cineál liosta anuas. 2.4) Cuir isteach uimhir fhad an téacs isteach sa luach Bosca téacs. Anois tá gach cealla comhoiriúnaithe liostaithe sa pháirc Super Find. Is féidir leat cliceáil ar an toradh liostaithe chun aistriú chuig an gcill sin láithreach. Más mian leat cealla a aimsiú agus a dtosaíonn nó a chríochnaíonn an trácht le téacs nó carachtar ar leith, is féidir leis an modh san alt seo cabhrú leat. 1. cliceáil Kutools > Super Faigh. 2.3) Roghnaigh Tosaíonn an téacs le or Críochnaíonn an téacs le ó na cineál liosta anuas. 2.4) Cuir isteach an téacs nó an carachtar isteach sa luach Bosca téacs. 3. Anois tá gach ceall a thosaíonn nó a chríochnaíonn an trácht le téacs nó carachtar áirithe liostaithe sa Super Faigh pane. Is féidir leat cliceáil ar an toradh liostaithe chun aistriú chuig an gcill sin láithreach. 2. Téann an cnaipe Roghnaithe go liath más rud é Bileoga oibre roghnaithe, Leabhar oibre gníomhach or Gach leabhar oibre roghnaíodh an rogha sa Laistigh de liosta anuas. 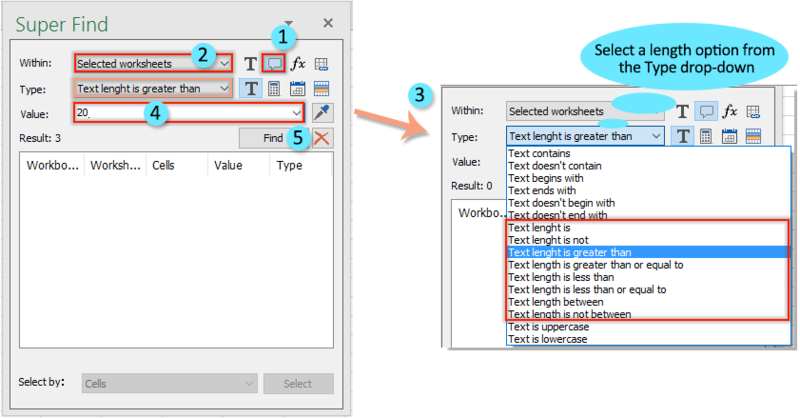 Kutools le haghaidh Excel áirítear níos mó ná uirlisí Excel 300 handy. Saor in aisce chun iarracht gan aon teorannú a dhéanamh i laethanta 60. Íoslódáil an triail saor in aisce anois! Is féidir leis na huirlisí seo a leanas a shábháil go mór do chuid ama agus airgid, a bhfuil ceann ceart agat? Tab Office: Ag baint úsáide as cluaisíní láimhe in d'Oifig, mar bhealach Chrome, Firefox agus Internet Explorer Nua. 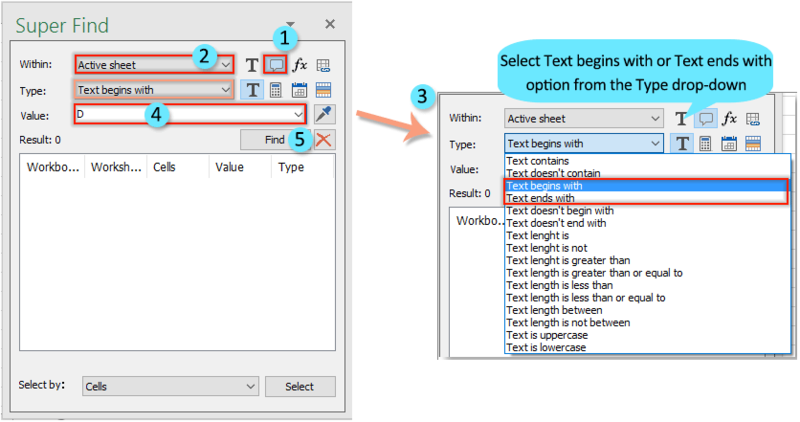 Kutools le haghaidh Excel: Níos mó ná 300 Feidhmeanna Casta le haghaidh Excel 2019, 2016, 2013, 2010, 2007 agus Office 365. Menu Classic don Oifig: Cuir biachláir eolasacha ar ais chuig an Oifig 2007, 2010, 2013, 2016, 2019 agus 365, amhail is dá mba Oifig 2000 agus 2003 é. Is é an fheidhmiúlacht atá tuairiscithe thuas ach ceann de na feidhmeanna cumhachtacha 300 de Kutools for Excel. 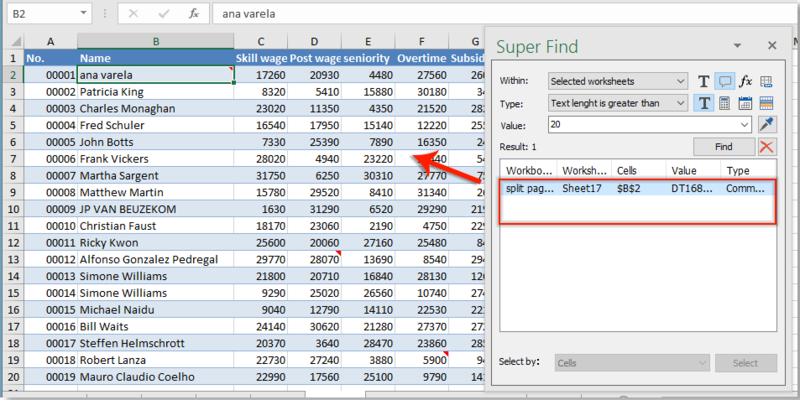 Deartha do Excel (Oifig) 2019, 2016, 2013, 2010, 2007 agus Office 365. Íoslódáil agus úsáid saor in aisce do laethanta 60.